Garrett and Co. was established in 1835 in North Carolina and was a manufacturer of American wines using the indigeous Scuppernong grape. 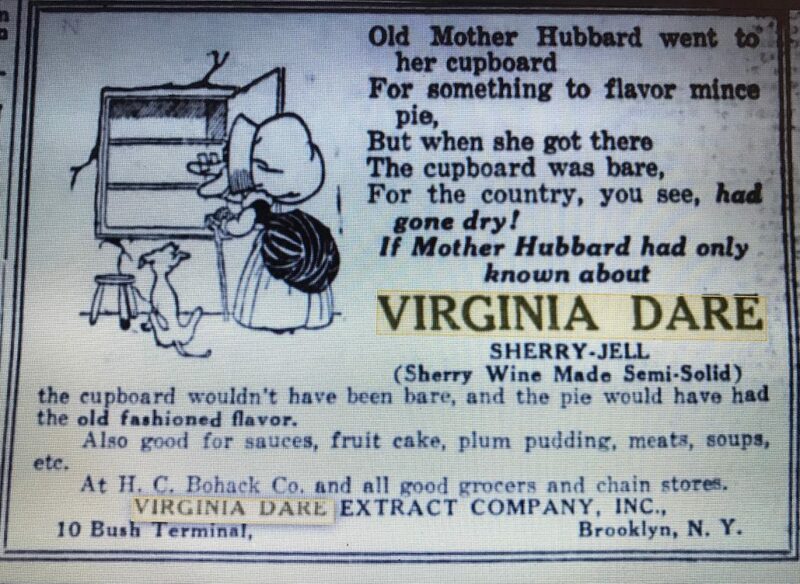 Virginia Dare was their most popular wine named for the first child born in America to English settlers. Dare was born on Roanoke Island which is also home to the Mother Vine, a Scuppernong vine said to be the oldest cultivated grapevine in the world. Pochahontas and Minnehaha were names of two other Garrett & Co wines. Paul Garrett served as president of the company from 1889 until his death in 1940. His obituary in the March 20, 1940 issue of the Brooklyn Daily Eagle provided some early history on Garrett and his company. Mr. Garrett was born in Halifax County, N.C. and at the age of 17 started work in Garrett & Co., which had been founded in 1835 by his father and an uncle, and which was then located at Weldon N.C. He became president of the company when he was 25 and started on a program of expansion which led in following years to offices in Norfolk, Va., in California and finally to establishing national headquarters for the business in Brooklyn in 1911. The first New York listing I can find for them is in the 1917 Telephone Directory. In the 1922 Copartnership and Corporation Directory of Brooklyn and Queens they’re listed as a distiller and rectifier of spirits. The address was 882 3rd Avenue (Building 10 of Bush Terminal). The company managed to survive and even prosper during National Prohibition but it literally took an act of Congress. A story in the August 4, 1919 issue of Elmira N.Y.’s Star Gazette describes the company’s approach. Paul Garrett of Garrett & Company, announces that he will buy grapes from the growers in this section as well as various other sections of country where his plants are located just as soon as the crop has matured sufficiently to be made into wine. Mr. Garrett will convert all of the fruit into wine, run it into the thousands of tanks and cases built for that purpose, let it age sufficiently and then transport the product to Brooklyn, where he has an immense plant at the Bush Terminal. Here the wine will be put through a secret process extracting the alcohol from it, and will then be marketed, a non-alcoholic pleasant beverage entirely in a class of its own and decidedly different from grape juice. The alcohol taken from the wine, Mr. Garrett says will be used in the manufacture of extracts such as vanilla, lemon, orange, etc. The bond demanded by Congress will increase proportionate to gallons of wine shipped until it will approximate a half million dollars. The product, although non-alcoholic, will be labeled wine and the regulation wine tax will be levied against each gallon manufactured. According to a story in the June 26, 1920 issue of the Brooklyn Daily Eagle, this allowed them to save and even enlarge their Brooklyn plant and build a 2,000,000 gallon storage plant in St. Louis. It also saved five plants in North Carolina, five plants in western New York, one plant in Ohio and four along the Pacific Coast. The story goes on to describe the Brooklyn operation in 1920. The Brooklyn plant is the main distributing center for the East. It employs about 125 men and about 60 women in the bottling and packing and storing plants; about 25 in the office. It turns out over 48,000 bottles of Virginia Dare non-alcoholic wine a day and between 50,000 and 75,000 bottles of Virginia Dare extracts between dawn and sunset. It covers 175,000 square feet of floor space in Bush Loft No. 10. Its big vats, filled with 1,750,000 gallons of wine waiting to be de-alcoholized, are kept in the cellars of both Loft No. 9 and No. 10. Beyond all doubt, they are Brooklyn’s most valuable and least dangerous cellars. A fleet of 100 big tank railroad cars is kept busy bringing in the wine for the de-alcoholizing process. These cars are all glass lined. It has an annual capacity of over 15,000,000 quarts of wine. It has a capacity of over 20,000,000 bottles of extract. 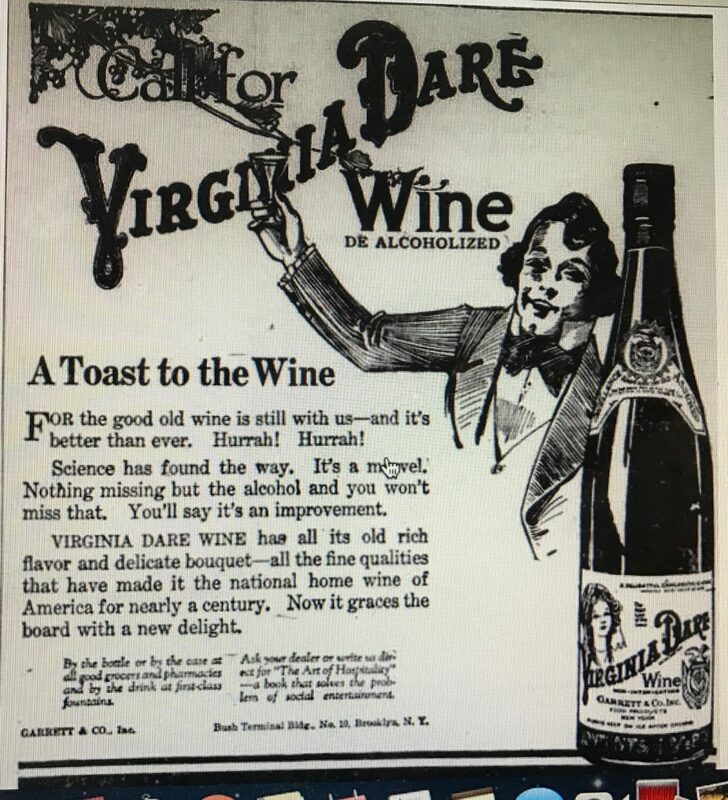 A prohibition era advertisement for the de-alcoholized Virginia Dare wine featured a bottle similar to the one I found. 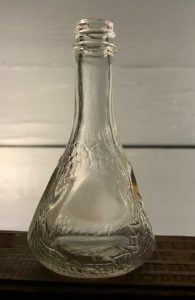 The bottle’s finish has a bead that looks like it will accept a crown cap but below the bead it looks more like a brandy finish. 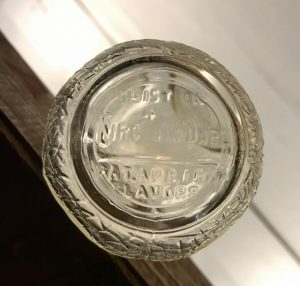 The company continued to make wine (and champagne) after the end of Prohibition and according to one Internet account held 10,000 acres of cultivated vineyard in New York, North Carolina and California in 1945. The winemaking business was sold to Constellation brands in 1965. The extract piece of the business continues to operate today.